Thematically, I am fascinated by a great many phenomena that can be observed in the social world, particularly if they involve networks. My past and current research has focussed on topics as diverse as the Second Lebanon War, the behavior of the Guantánamo detainees, the transnationalization of everyday life in Europe, as well as transnational human mobility and communication in general. Theoretically, my research is building on a broad variety of theories and concepts from several fields, including sociology (power-dependence, game theory, intervening opportunities), social psychology (learned helplessness), criminology (mosaic theory), economic geography (distance decay, gravity models) and political science (democratic peace theory, transactionalist theory). Methodologically, I have used mostly quantitative methods from logistic, OLS, and multilevel regression to Kolmogorov-Smirnov-tests for the detection of power laws and a variety of SNA methods (ERGM, MRQAP). I have also worked with time-series cross-section (TSCS) data and applied accordant methods. Empirically, I have not only conducted secondary data analyses with existing large-scale datasets (Eurobarometer, Latinobarometer, Afrobarometer, European Values Study, World Values Survey) and combined information from various sources (UN, UNHCR, UNWTO, World Bank, etc.) to create new research material (both monadic and dyadic), but I have also constructed novel datasets and network matrices. 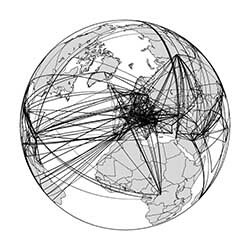 This PhD project aims at analyzing the spatial, social, and temporal structure of transnational human mobility (THM) and communication (THC). In specific, I examine (a) how various forms of THM (migration, tourism, student exchange, asylum seeking, human trafficking, etc.) and THC (telephone calls, online Friendships, remittances, etc.) are structured by physical space and to which extent this spatial structuring resembles Lévy flights that have been found in movement patterns of a diverse set of species; (b) how THM and THC cluster within world regions and to which extent this regional clustering is determined by geographic (e.g. contiguity, distance), political (e.g. visa restrictions, common IGO membership), economic (e.g. difference in standard of living, presence of trade relations), and cultural (e.g. language homogeneity, common colonial past) factors; (c) how various forms of THM have developed in space over time. Is the tie density within world regions increasing relative to inter-regional densities (regionalization), or are the gaps between clusters of THM and THC diminishing in relative terms (globalization)? 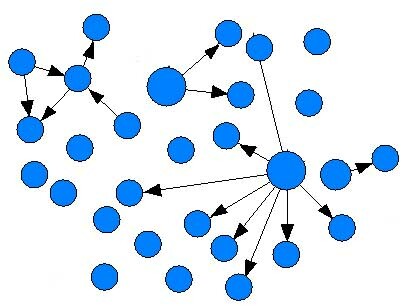 These questions are analyzed by applying social network analysis methods (such as MRQAP) to network matrices and country attribute data which have been collected from a wide range of sources (UN, WTO, UNHCR, World Bank, etc.). Deutschmann, E. (2013). “Mapping the Transnational World”, paper presented at the PhD Workshop Migration, Citizenship and Transnational Politics, Humboldt University of Berlin, Germany. Deutschmann, E. (2013). “The Social Stratification of Continental Attachment in Africa, Europe and Latin America”, paper presented at the European Sociological Association 11th Conference, University of Turin, Italy. Deutschmann, E. (2013). “The Social Stratification of Transnational Attachment in Africa, Europe and Latin America”, paper presented at the GLOREA Closing Conference: Transnationalism, Cosmopolitanism, Mobilities, Aarhus University, Denmark. Deutschmann, E. (2013). “Towards one single Latin American Society? Identity in Latin America between the Nation-state and World Society”, paper presented at the 1st Latin America Conference Ireland, University College Dublin, Ireland. Transactionalist integration theory assumes that transnational interaction enhances supranational identification. Against this backdrop, this project examines processes of transnationalization in the everyday life of EU citizens. In specific, we address questions such as the following: In what ways do Europeans interact across borders? To which extent do they engage in transnational activities within Europe and to what extent with places outside Europe? Are transnational practices in Europe predominantly stratified vertically by class and education, or rather differentiated horizontally, e.g. by age? What are the major societal drivers of social transnationalization, and how big are the differences between nations? What are the implications of transnational interactions for transnational identities and European policy preferences, and how large is the potential of political conflict? This project is based on quantitative data analysis and includes all member states of the European Union. The main data source is the Eurobarometer, complemented by process-generated transaction data. The project promises to enhance our understanding of the extent, determinants and conflict potential of transnationalization in Europe. Delhey, J., Deutschmann, E. & Richter, K. (2014). “Class Project or Individualization? The Stratification of Europeans’ Transnational Activities”, Pre-prints of the DFG Research Unit “Horizontal Europeanization”, 2014-04, Carl von Ossietzky University of Oldenburg. Delhey, J. & Deutschmann, E. (2013). “Who are the Europeans? Reassessing Fligstein’s Class Project Paradigm”, paper presented at the 20th International Conference of Europeanists, University of Amsterdam, Netherlands. Delhey, J. & Deutschmann, E. (2013). “Class, Modernization, and Transnational Life-Styles: Evidence from Europe”, paper presented at the European Sociological Association RN 15 Mid-term Seminar, University of the Basque Country, Bilbao, Spain. This project focussed on the behavior of the Guantánamo detainees in terms of collaboration and disobedience and how it influences their chances of getting a release recommendation. Memoranda on 765 detainees authored by the Joint Task Force Guantánamo (JTF-GTMO) and published by Wikileaks in April 2011 were used to create a network of accusations between detainees and an attribute dataset, which were analyzed using multivariate regression and Kolmogorov-Smirnov tests. It was found that while the distribution of incriminating statements obeys a power law, 62.6% of all detainees do not incriminate anyone. Yemenis and Saudi Arabians heavily over-contribute regarding incriminating statements and disobedient actions, whereas Afghans and Pakistanis under-contribute. Disobedient behaviour does not affect the likelihood of getting a release recommendation, except for hunger striking, which has a negative effect. By releasing information, detainees don’t improve their own chances of getting release recommendations but impair those of the detainees they implicate. Three different groups of detainees were identified whose behavioral patterns seem to follow distinct logics. Deutschmann, E. (2014). “Between Collaboration and Disobedience: The Behavior of the Guantánamo Detainees and its Consequences”, Journal of Conflict Resolution, ahead-of-print. DOI: 10.1177/002200271454­5331. Deutschmann, E. (2013). "Between Collaboration and Disobedience: The Behavior of the Guantánamo Detainees and its Consequences”, Sociology Working Paper, 2013-02, Department of Sociology, University of Oxford. Deutschmann, E. (2012). "Between Collaboration and Disobedience: The Behaviour of the Guantánamo Detainees and its Consequences”, Thesis (MSc), University of Oxford. Deutschmann, E. (2012). “Cooperation, Defection, or Disobedience? The Prisoner’s Dilemma of the Guantanamo Detainee”, paper presented at the 5th Analytical Sociology Conference, Columbia University, New York. Deutschmann, E. (2012). “The Prisoner’s Dilemma of the Guantanamo Detainee: A Social Network Analysis”, paper presented at the 16th Annual Aage Sørensen Memorial Conference, Stockholm University. 1. The Second Lebanon War and the Democratic Peace Theory's Dyadic Hypothesis - A Contradiction? The dyadic hypothesis of the Democratic Peace Theory (DPT) states that democracies do not go to war with other democracies. In this case study, I examined whether the Second Lebanon War constitutes a contradiction to this hypothesis. I showed that if the criteria that are generally applied in quantitative studies on the topic are used as a benchmark, there indeed is a contradiction between this war and DPT. 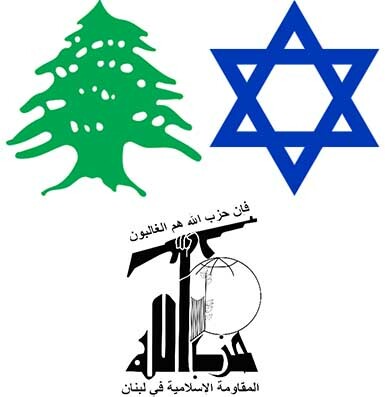 However, if one is to refine the definition of the variables by taking additional criteria into consideration, or if one is to understand Hezbollah as an actor that operates independently of the Lebanese state, the dyadic constellation is no longer given, rendering the question irrelevant. Thus, while the Second Lebanon War constitutes no clear contradiction to the dyadic hypothesis of DPT, this study showed that in order not to become obsolete, DPT needs to develop new theorems about the relationship between war and democracy in a world of asymmetry and multiple, overlapping souvereignty, taking para-statal entities into account. Deutschmann, E. (2012). "Der Zweite Libanonkrieg und die dyadische Hypothese der Theorie des demokratischen Friedens – ein Widerspruch?“ [The Second Lebanon War and the Democratic Peace Theory’s Dyadic Hypothesis – A Contradiction? ], Arbeitspapiere zur Internationalen Politik und Außenpolitik, AIPA 2/2012, University of Cologne. Deutschmann, E. (2011). "Der Zweite Libanonkrieg und die dyadische Hypothese der Theorie des demokratischen Friedens – ein Widerspruch?“ [The Second Lebanon War and the Democratic Peace Theory’s Dyadic Hypothesis – A Contradiction? ], Thesis (BSc), University of Cologne.